Yup, Robusta, you read correctly. Come to our Brooklyn cafe - a place we surely consider to be a specialty coffee establishment - and drink some Robusta. For those of you lost in the land of pourover stations, cortados served as macchiatos and cappuccinos that are no different from lattes, and who may not know much about Robusta, know that Robusta is a commonly reviled, denegrated and maligned bean which causes coffee snobs across the specialty coffee world to scoff, sneer and turn away with a conspicuous uplift of the nose. Coffea Canephora, commonly known as Robusta coffee, is one of the two main coffee varietals that is commercially grown (the other is Arabica; there are others such as Liberica, but they are not common). What we have here is the first ever Robusta to achieve the new R Certification from the Coffee Quality Institute (CQI) and the Specialty Coffee Association of America (SCAA). The CQI cupping report and score can be found here. 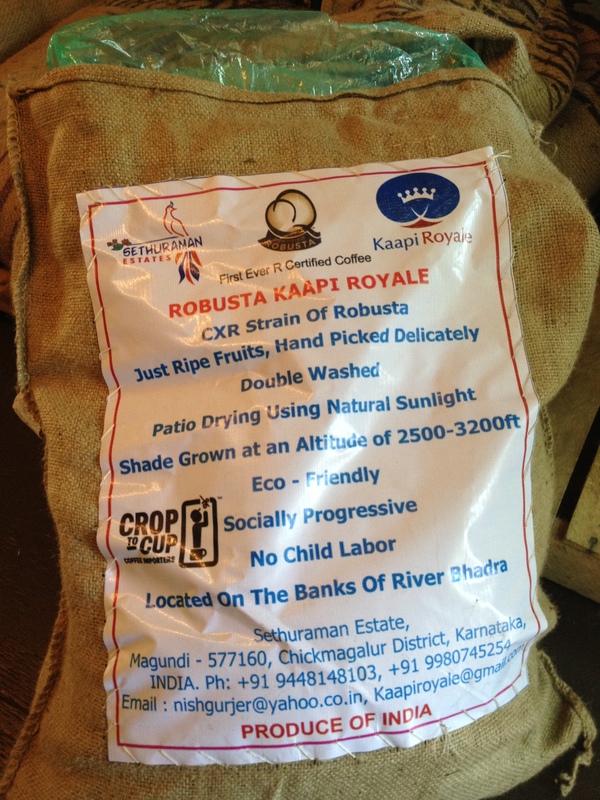 Crop to Cup Importers is the sole importer of this bean from Kaapi Royale and the Sethuraman Estate in Magundi, Karnataka State, India. What makes these beans different from nearly every other Robusta on the planet is that they are actually clean, green (in color) and sustainably grown... and it tastes quite good! Plus the burlap bags (and grainpro liner) are friggin'... awesome! No, this is not a cheap alternative to Arabicas. 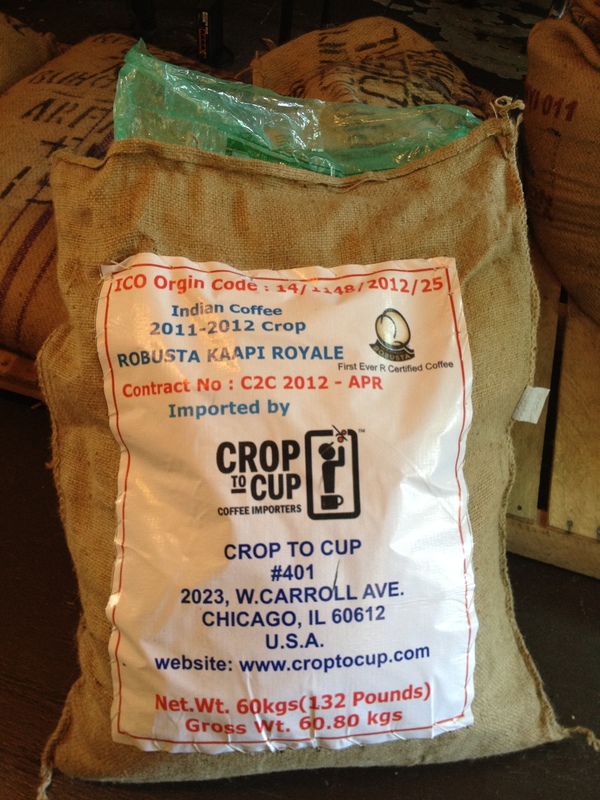 When compared with other green coffees we sell to roasters, this is about 60% more costly than other Robustas. However, compared to Arabicas, it fetches about the same price as a standard mid-grade washed Arabica. This is a washed Robusta, as opposed to the natural process method normally used for Robusta. The majority of Robustas on the market taste quite harsh, and while we can't say that this coffee is going to be as bright, fruity and chocolaty as a nice washed Arabica bean, it is astounding to discover the cleanliness, body and complexity that can be achieved in Robusta through the growing, harvesting and processing practices of the Sethuraman Estate. This is an exciting progression in the coffee industry, especially when you consider the hundreds of thousands of impoverished Robusta farmers around the world (those not lucky enough to live at altitudes where Arabica grows) who would love to see Robusta prices increase in exchange for their quality improvement efforts. We've had a lot of interest in this bean from roasters interested in using it in their espresso blends, and we're even experimenting with it here at our cafe in Brooklyn. For a limited time (probably a week or two) we're trying it out as a small component (about 10%) in our espresso blend and we'll even serve it up to you straight if you want a cup. You can choose from two types - the RKR (the R-Certified bean) and the Peaberry version, which - while not R-certified - is from the same farms and processing, just separated out from the normal shape beans. The RKR is clean and pleasant. The PB the same, with a bit of added complexity and body. So, we invite coffee elitists to get off their high horses and stop on by for a cup of Robusta. Then you can become a Robusta elitist.